Mish's Global Economic Trend Analysis: Bubblicious Questions: What Causes Economic Bubbles? When Do Bubbles Burst? Can the Fed Prevent Bubbles? Bubblicious Questions: What Causes Economic Bubbles? When Do Bubbles Burst? Can the Fed Prevent Bubbles? Today I am going to ask three simple questions that have easy to understand answers. Can the Fed Prevent Bubbles? Before answering the questions (and hopefully many of you know the answers already), let's tune in to what the Dallas Fed has to say regarding bubbles in its report Globalization and Monetary Policy Institute Working Paper No. 167, entitled "The Boy Who Cried Bubble" by authors Yasushi Asako and Kozo Ued. The article is 44 pages long. In the opening paragraph on page two, the authors state "History is rife with examples of bubbles and bursts. A prime example is the recent financial crisis that started in the summer of 2007; However, we have limited knowledge of how bubbles arise and how they can be prevented." One could safely stop reading right at that point knowing full well that what follows cannot possibly be anything but self-serving platitudes and incomprehensible mathematical gibberish. And that is precisely the case. 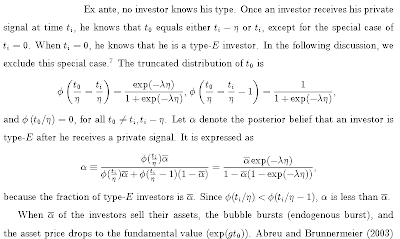 The mathematical gibberish starts on page five and continues for the entire remainder of the document. Here is a quick sample from page seven. All the remaining pages are equally incomprehensible to all but the geekiest of geeks. Here is another example from page 39. 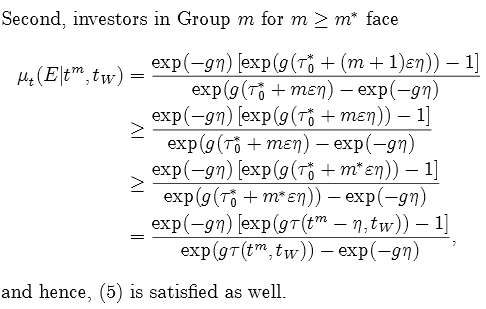 I am quite sure there are some academic geeks who understand the formulas presented by Yasushi Asako and Kozo Ued. 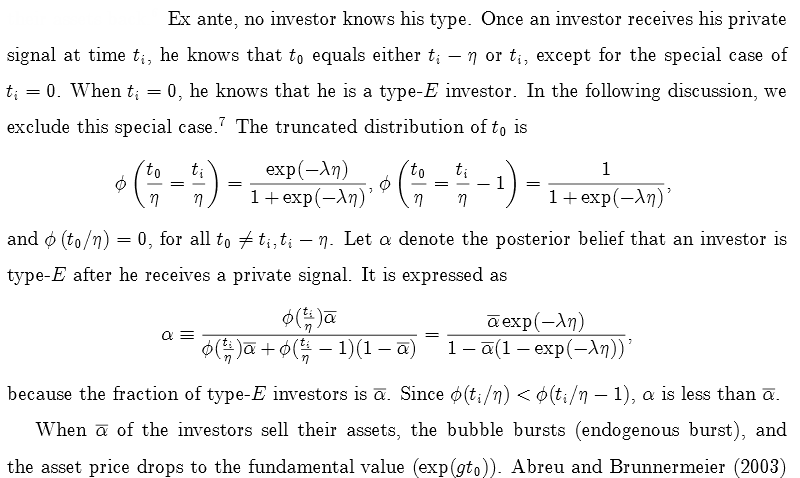 Regardless, it's all mathematical nonsense in light of their ridiculous conclusion stated upfront "We have limited knowledge of how bubbles arise and how they can be prevented." Every economic bubble in history started with reckless expansion of money supply and credit, reckless manipulation of interest rates, or government promotions of "low-risk" something for nothing schemes. For example, Tulipmania was a futures manipulation and options scheme (credit with leverage) accompanied by futures rules changes enacted by the Dutch Legislature in 1636. For more examples, including a discussion of the John Law Mississippi Bubble scheme, please see Why does fiat money seemingly work? The author,"Trotsky", is a purposely-sarcastic alias of Pater Tenebrarum at the Acting Man blog. Yet, Bernanke did not see the housing bubble. 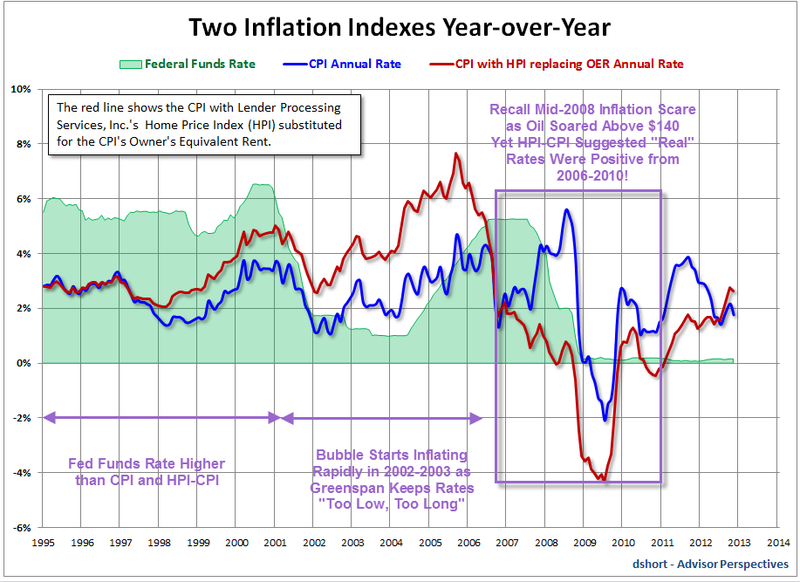 The Fed did not consider asset inflation, including home prices. Instead of focusing on the Home Price Index (HPI) or numerous other housing indices (all showing bubble conditions), the Fed focused on Owners' Equivalent Rent (OER). 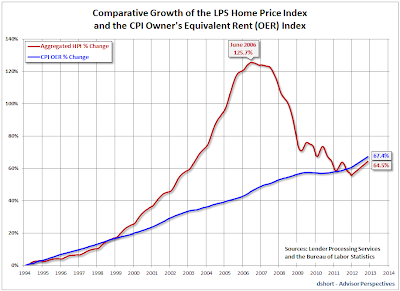 The above chart shows the effect when housing prices replace OER in the CPI. 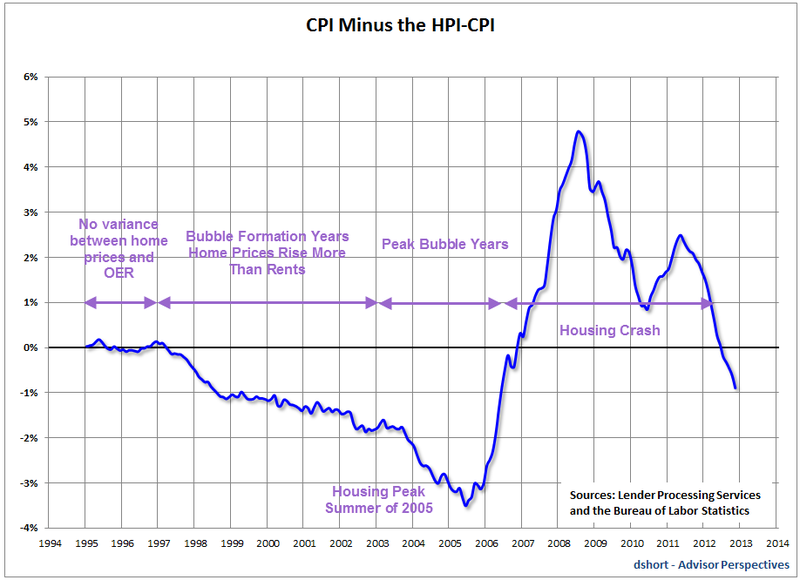 In mid-2004, the CPI was 3.27%, the HPI-CPI was 5.93% and the Fed Funds Rate was a mere 1%. By my preferred measure of price inflation, real interest rates were -4.93%. Speculation in the housing bubble was rampant. In mid-2008 when everyone was concerned about "inflation" because oil prices had soared over $140, I suggested record low interest rates across the entire yield curve were on the way. 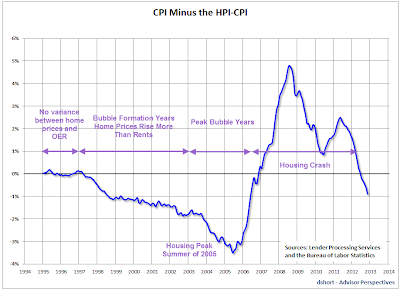 At that time the CPI was close to 6% but the HPI-CPI was close to 0% (and plunging fast). 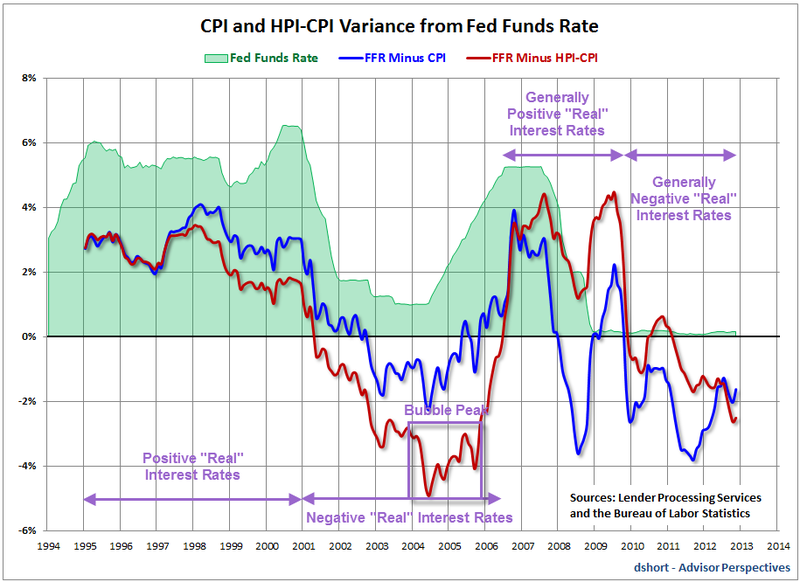 As measured by HPI-CPI real interest rates were positive from mid-2006 all the way to 2010, even when the Fed Funds rate crashed to .25%. That shows the power of the housing crash. Real rates went positive again in mid-2010 until early 2011. The above chart shows the "Real" (inflation adjusted) Fed Funds Rate as measured by the Fed funds rate minus the CPI, and a second time by the Fed Funds Rate minus the HPI-CPI. With the recent rise in housing prices, the HPI-CPI is 2.78% while the CPI as stated by the BLS is 1.76% (both numbers from November). In my estimation, the BLS and Fed now understate price inflation by a full percentage point. Inflation as measured by expansion of credit is another matter. In short, the Fed held interest rates too low, too long, fueling asset inflation and credit expansion on ever-easing terms, the primary way in which bubbles are blown. Government policy, notably President Bush's "Ownership Society" coupled with countless "affordable housing programs" and Greenspan's promotion of variable interest rate loans and derivatives was icing on the bubbleicious cake. Bubbles burst when the pool of greater fools runs out. Yes, it is precisely that simple. Bear in mind, timing can be difficult, but sometimes there are precise clues. The housing bubble burst within a month of people standing in long lines and entering lotteries for the right to buy Florida condos. Lesson: Sentiment can always get more extreme (Until it can't). I used sentiment to call the precise top of the housing bubble in summer of 2005. Here is a brief flashback history. I updated that chart numerous times, in real time, since then. Make enough predictions and sooner or later you are going to look mighty foolish. Since someone is bound to point them out, you may as well admit them yourself. 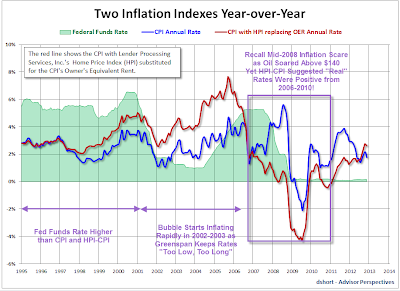 That said, my underlying thesis is correct: Once again the Fed has totally and completely ignored asset price inflation, and once again, the Fed cannot see a massive bubble staring them right in the face. This bubble will bust, on time, like all other bubbles, as soon as the pool of greater fools runs out. That is kind of a trick question. The correct answer is "In general, bubbles can be prevented". The "trick" is I modified the question from the title of this article "Can the Fed Prevent Bubbles?" The answer to the question as originally posed is an emphatic "No!" The Fed cannot prevent what it cannot see, even after the fact, when bubbles are in plain sight to any clear-thinking person. More importantly, the biggest cause of economic bubbles is the Fed (central banks in general). It is axiomatic that the cure for the disease cannot possibly be the same as the cause of the disease (the Fed). A small bit of common sense is far better than ridiculous formulas that cannot possibly work in the real world. The way to prevent bubbles is easy enough in theory: Get rid of the Fed; get rid of government-sponsored corporatism; stop government central-planning activities, and instead try free-market economic solutions. Since no Fed-sponsored research could possibly come to the correct conclusion, the Fed and its research departments both sit in academic wonderland, hiding behind obscure mathematical absurdities that do not and cannot work in the real world. For rebuttal of other equally ridiculous self-serving Fed propaganda, please see Money as Communication: A Purposely "Non-Educational" Fallacious Video by the Atlanta Fed.